With Rosh Hashana less than 12 hours away, it may seem a bit late to be posting a cake for the Jewish New Year. However: however. Some of us leave the cooking until the last minute, yeah? And besides: if someone had shared this cake at the same time last year, I'd have read it and realized that I focused so intently on getting that brisket just perfectly seasoned, that challah burnished and browned just so, that there was absolutely no dessert. There was a Rosh Hashana meal at my house last year when my gracious guests nibbled on leftover apples and honey after the meal was done. This year, I've got dessert covered, for you and me both. 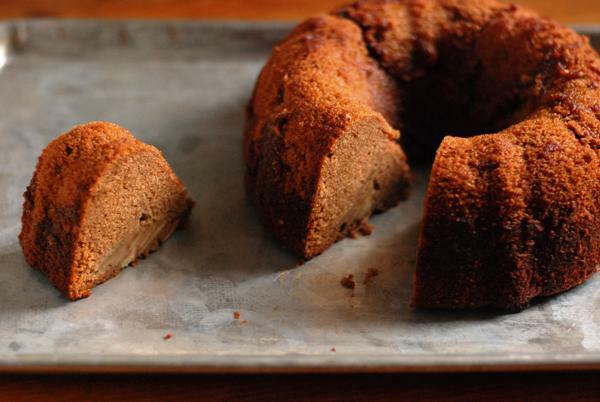 Apple cake is traditional on this holiday, as is honey cake. Why not combine the two? If you make this into just one cake, it is a monstrosity, a tall and majestic cake with spices that demand to be heard as well as seen (the cake is a deep, dark brown). The apples are sprinkled with sugar and spice all their own, and after a nice, long stretch in a hot oven, they soften just enough while keeping their texture. You'll be delighted to know that you can make this cake without any special equipment. No mixer necessary; I stirred the batter with a fork. 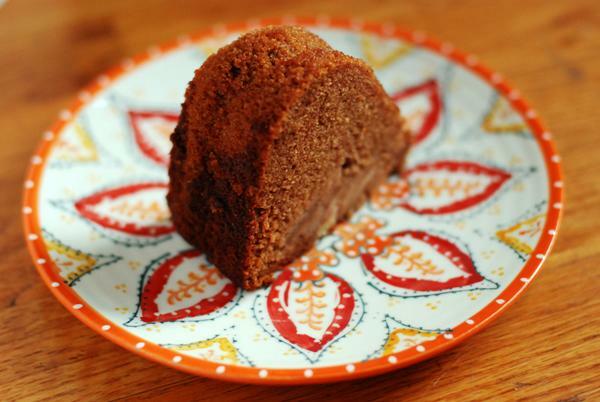 And while I made this in a bundt pan, you can make it in three loaf pans, two round pans, or one 9x13 pan. At this stage in the game, options are key. Ironically, this new year I'm resolving to slow down a bit. The pace around here has been frenetic, and I'd like it to stop being that way. Dear friends of ours are getting married and having babies; summer is turning to fall in the most beautiful of ways; fruit and vegetables really are at their peak right now; and I'm creeping closer to the big 3-0 every day. Last-minute desserts notwithstanding, I'm going to try and enjoy these special days as best I can. There's a lot to savor right now. To everyone celebrating, shana tova; to everyone else, enjoy this lovely season. This cake calls for orange juice and either tea or coffee as the liquid. I really dislike the flavors of apples and oranges together; hello, it's like mixing apples and oranges. So I swapped out the OJ for cider, which really reinforced the apple flavor in this cake. For me, honey cakes require the depth and thickness of coffee, but if you'd prefer tea's flavor, feel free to substitute it. In a medium bowl, mix apple slices with 2 tablespoons sugar and 2 teaspoons cinnamon. Set aside. Preheat the oven to 350°F. Lightly grease the pan(s). For tube and angel food pans, line the bottom with lightly greased parchment paper. In a large bowl, whisk together the flour, baking powder, baking soda, salt, and all the spices and the remaining 4 teaspoons cinnamon. Make a well in the center and add the oil, honey, sugars, eggs, vanilla, coffee, apple cider, and whiskey. Using a strong wire whisk or a fork, combine the ingredients well to make a batter, making sure that no ingredients are stuck to the bottom of the bowl. If making a bundt cake, spoon one-third of the batter into the pan. Top with a ring of half the apples (try to remove them from the liquid that will have accumulated; reserve this liquid for another use), then repeat with another third of the batter, the rest of the apples, and the final third of the batter. If making this in loaf pans or round pans, pour one-quarter of the batter into each of the pans; divide all the apples between the two pans; and divide the remaining half of the batter between the two pans. If making this in a 9x13 pan, pour half the batter into the pan; top with all of the apples; and pour the remaining batter on top. In a bundt pan, the apples may float to the top. They're unlikely to stay in layers. That's ok; still better to layer them in so they're fully coated with batter. Place the cake pan(s) on baking sheets stacked together and bake until the cake springs back when you touch it gently in the center. For angel and tube cake pans, bake for 60 to 70 minutes; loaf cakes, 45 to 55 minutes. For sheet-style cakes, the baking time is 40 to 45 minutes. This is a liquidy batter and, depending on your oven, it may need extra time. Cake should spring back when gently pressed. If you're not sure, check it with a toothpick, which should come out clean.